Louis Vuitton has opened a new flagship store in London, a shopping destination which many are calling the French fashion brand's most luxurious. The 15, 000 square meter space features a handbag bar, where shoppers can order customized purses as easily as cocktails, a two-level trunk wall, and a dynamic LED staircase. This ever-changing light show links the store's three levels. 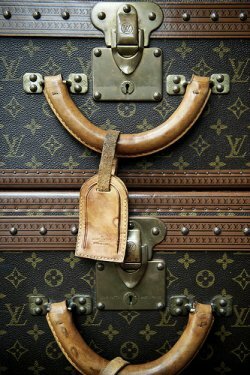 And of course, there are plenty of luxurious Louis Vuitton goodies to take home. "People come to Louis Vuitton stores not only for shopping but also to experience a certain way of life," explained chief executive Yves Carcelle. "These stores, named Maisons, have become our iconic landmarks across the world." They're big claims indeed, but it seems like Louis Vuitton might make good on them with this luxurious new London store. Make sure you put it on your travel itinerary next time you're visiting the Old Dart!